Using Google Maps, we researched the distances between towns (that shared approximately the same latitude) and the ocean. For example, we compared Casablanca and Marrakech in Morocco. We compared 4 pairs of towns and noticed that for the towns closer to the ocean, the climate was milder: we observed milder winters and summers compared to the towns that were inland. 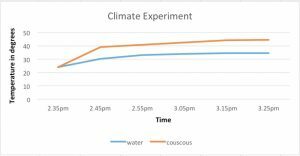 The presence of the ocean has an influence on climate… To understand one of the reasons for this, we ran an experiment to compare how water and a solid (couscous) react to being exposed to a source of heat. 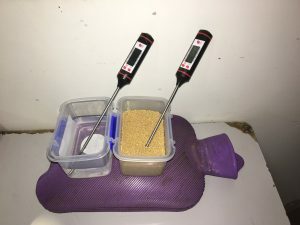 The same volume of water and couscous being heated and the temperature measured. All students created graphs in excel to display the data in visual form. This experiment showed us that water and land (represented by couscous) react differently to being exposed to a source of heat. Although the ocean absorbs the heat from the Sun, it is less sensitive to variations of heat and this allows coastal regions to enjoy a more stable thermal environment. In Science, this phenomenon is known as the thermal inertia of oceans.